Participants of the International Meeting on Syrian Settlement in Astana. Center: Head of the Syrian opposition delegation Mohammed Aloush of Jaish al-Islam. Telebridge between the two countries furthered mutual understanding. The second round of peace talks between the Syrian government and the armed opposition took place in the Kazakh capital of Astana on Feb. 15-16, and resulted in the creation of a joint group. Russia, Turkey and Iran, who are mediating the peace talks, will monitor the ceasefire that came into effect on Dec. 30. At the end of the talks on Feb. 16, Russia's Federation Council, (the country's upper chamber of parliament), held its first Moscow-Damascus telebridge to give Federation Council senators the chance to discuss the peace talks with Syrian MPs. 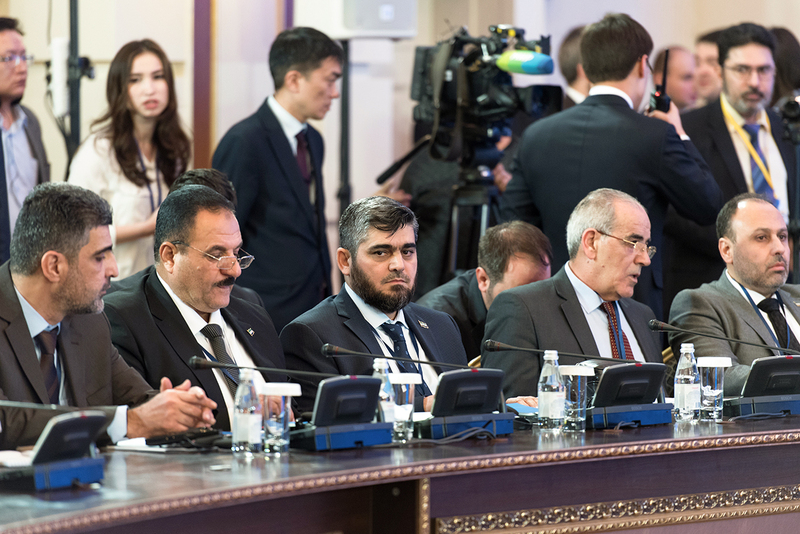 Members of the Russian and Syrian delegations in Astana also joined the dialogue. Konstantin Kosachev, chairman of the Federation Council's Foreign Affairs Committee, said the dialogue with Syrian MPs helped them understand Damascus' viewpoint. In addition, Kosachev proposed that his colleagues in Damascus make a joint statement on Syria at the 137th session of the Assembly of the Inter-parliamentary Union, which will take place in St. Petersburg in October. During the telebridge Stanislav Gadjimagomedov, deputy director of the Main Operations Directorate of the Russian General Staff, said the ceasefire in Syria has been respected so far, and that 64 armed opposition groups and 1,249 towns and cities are adhering to the ceasefire agreement as of Feb. 15. There are still tensions in the districts of East Ghouta (a suburb of Damascus) and in the cities of Daraa and Homs. Clashes involving heavy weapons continue to take place in all these areas. Gadjimagomedov blamed Al-Nusra Front terrorists, who continue to infiltrate the ranks of the opposition and try to sabotage peace efforts by provoking armed confrontations. As far as the humanitarian situation, it's still catastrophic, said Ashbak Abbas, an independent deputy of the Syrian National Council. "Humanitarian aid is politicized," she remarked, adding that some countries refuse to help regions under government control, although the situation there is no less deplorable than in the territories under the opposition's control. Damascus expressed gratitude to Russia, which has been providing humanitarian aid to Syria on a regular basis. Deputy Chairman of the Federation Council's Foreign Affairs Committee, Ziyad Sabsabi, said that on Feb. 15 alone more than six tons of humanitarian aid were delivered to Syria. "Russian army officers have practically become employees of humanitarian aid organizations," he noted. Moscow and Damascus see eye to eye on most issues, remarked MPs from both countries. "Russia came to Syria to protect our statehood," said the chairman of the Arab Socialist Union Party, Khaled Abbud. But the telebridge also showed that on certain issues Syria is more intransigent than Russia. Syrian MPs, for example, did not mention the "opposition," but instead only spoke of the "fight against terrorism". Akhmed Kuzbari, a member of the Syrian National Council Foreign Affairs Committee, said that, "Anyone who takes up arms against a legal government is a terrorist." Kuzbari accused the Persian Gulf countries, the U.S. and Turkey, who is one of the mediators in Astana, of supporting terrorists. Russian MPs agreed that the fight against terrorism is important but refrained from accusing various countries, emphasizing that the Syrian crisis cannot be solved militarily and that a political solution is needed.